My friend Peter Helland Hansen, who builds clinker built boats at Hardanger Fartøyvernsenter, is a lover of traditional handtools. He has done extensive research on local tools in Hardanger and made his own tools based on his findings. He uses mostly handtools and traditional workbenches in his work. This winter Kate McMillan, a scholarship student from Yale University, is doing her research in the small boats workshop. As a part of her research she has her own blog where she writes and draws about the work in the workshop and the tools that are used in the different parts of the building process. 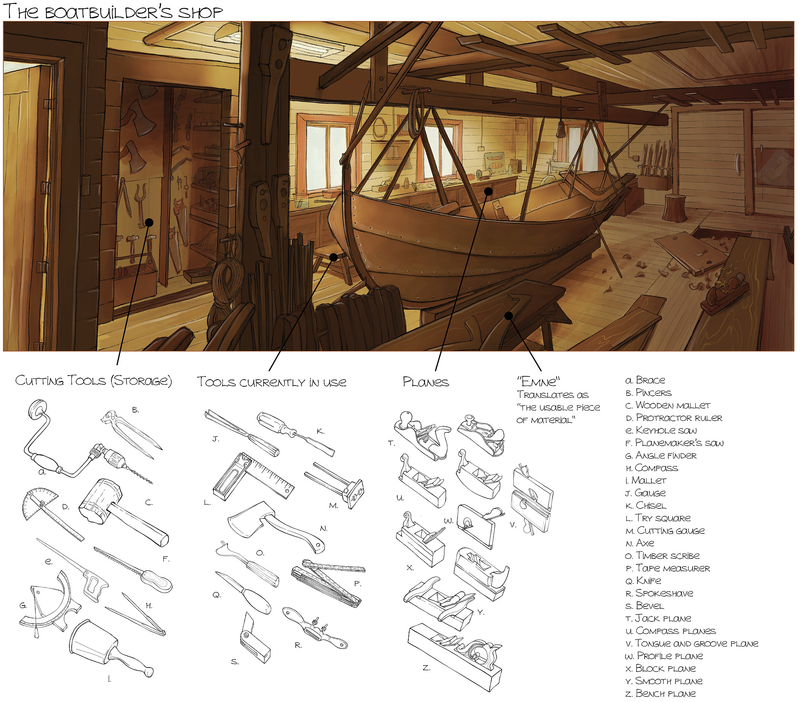 I think the drawings contains a lot of relevant information about the work and the tools. This is a good example of how you could explain and illustrate rather complex working processes and workshop interiors. Roald – thanks for showing us Kate’s work. Fabulous. Ha, ha, looks like you got Carl Larsson to paint the workshop. Wonderful! What beautiful, instructive, and clear drawings. Thanks for sharing Kate’s inspirational work, Roald.